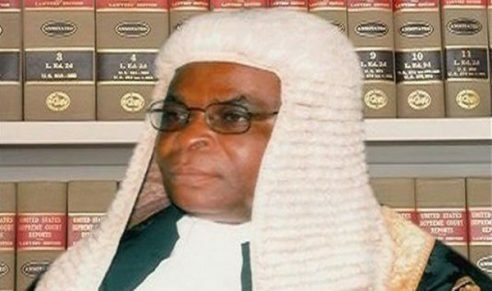 LAGOS JANUARY 26TH (NEWSRANGERS)-The purported suspension of the Chief Justice of Nigeria (CJN), Honourable Justice Walter Onnoghen, by President Muhammadu Buhari is unequivocally unconstitutional, illegal, immoral and grossly indefensible. What General Buhari has done, putting it mildly, is a brazen coup against democracy. 1. The office of the CJN is not a ministerial or extra-ministerial position. It is a creation of Sections 230 (1) (a) and 231 (1) and (2) of the Constitution of the Federal Republic of Nigeria, 1999 (as amended) (subsequently referred to as ‘the Constitution’). 2. The Chief Justice of Nigeria is the head and symbol of authority of the Nigerian Judiciary. The Judiciary is neither an agency of the federal government nor a department in the Executive. It is one of the three Arms of Government and is established by Section 6 of the Constitution. The CJN is to the judicial arm of government what the President is to the executive arm. The three arms are co-equals and none is subservient to the other. 3. The President cannot appoint or remove the CJN unilaterally. The Constitution has explicitly stated the procedure for the appointment and removal of the CJN and no court, tribunal, president or other authority or person in Nigeria can derogate from, override or alter the said procedure. 4. By Section 231 (1) and (2) of the Constitution, the appointment of the CJN requires the compulsory involvement of the three arms of government. The President appoints the CJN on the recommendation of the National Judicial Council (NJC) subject to the approval of the Senate. 5. By virtue of Section 292 (1) and Paragraph 20 and 21 of the Third Schedule to the Constitution, the CJN enjoys security of tenure and is not removable except within the strict procedure and for the specific reasons enshrined therein. 6. The CJN as a judicial officer can only be removed from office by the President acting on an address supported by two thirds majority of the Senate for his inability to discharge the functions of his office or appointment (whether arising from infirmity of mind or body) or for misconduct or contravention of the Code of Conduct. Anything contrary to this procedure is unconstitutional. 7. The NJC has not recommended the removal of Justice Onnoghen to the President. The NJC has not exercised its exclusive disciplinary control over Justice Onnoghen. Only the NJC is constitutionally vested with the power of disciplinary control, including power of suspension, over a judicial officer. In exercising that power, Section 158 (1) of the Constitution states that the NJC shall not be subject to the direction or control of any other authority or person. See the case of JUSTICE RALIAT ELELU-HABEEB & ANOR. ATTORNEY-GENERAL OF THE FEDERATION & 2 ORS. (2012) NWLR (PT. 629) 1011 where the Supreme Court emphatically pronounced on the issue of how a judicial officer can be sanctioned. 8. I have perused the Certified True Copy of the enrolled ex-parte order made by the Code of Conduct Tribunal dated Wednesday, 23rd January, 2019. I find the said order extremely offensive to the Rule of Law. The Order seeks to achieve that which the Constitution has unarguably forbidden. 9. The enrolled order signed by the Chairman of the Code of Conduct Tribunal (CCT), Hon. Danladi Y. Umar, and one other member of the Tribunal (Hon. Mrs. Julie A. Anabor), purports to direct Hon. Justice Onnoghen to ‘’step aside’’ as the CJN and Chairman of the NJC pending the determination of the Motion on Notice dated the 10th day of January, 2019. On the face of the said order, the name of the legal practitioner who moved the motion ex-parte is not stated. This is rather strange. Did the Tribunal suo moto (on its own motion) move the motion? 10. Interestingly, the same Tribunal sat on Tuesday, 22nd January, 2019 and adjourned to Monday, 28th January, 2019 to rule on the Preliminary Objection filed by Justice Onnoghen challenging the jurisdiction of the CCT to try him without recourse to the NJC contrary to the decision of the Court of Appeal in the case of NGANJIWA v FRN (2017) LPELR-43391(CA). 12. The CCT, without determining whether it has jurisdiction over Justice Onnoghen as required by law, proceeded to give a flagrantly illegal order purporting to suspend the CJN from office. That order, with the greatest respect, is reminiscent of the inglorious order given by Justice Bassey Ikpeme stopping further announcement of results of the June 12, 1993 presidential election which crystalized into the criminal nullification of the June 12, 1993 election by the Babangida junta. 13. I have read the long statement made by President Buhari while swearing-in Hon. Justice Ibrahim Tanko Mohammed as the Acting Chief Justice of Nigeria. Buhari struggled unsuccessfully to justify his unlawful action by relying on the order of the CCT. The Constitution does not say that the President shall suspend the CJN based on the order of a court or tribunal. It is a desecration of our Constitution for Buhari to suspend Justice Onnoghen. 14. Those arguing that the President merely suspended the CJN and has not removed him are either oblivious of the law or willfully mischievous. The CJN is not an appointee of the President and does not hold office at the pleasure of the President. 15. President Buhari cannot suspend the CJN. The CCT cannot give an order directing the President to remove or suspend the CJN. The CCT cannot ask the CJN to ‘’step aside’’. This conspiratorial attack on the institution of the Judiciary is a dangerous precedent. Can a judge give an order suspending the President from office without recourse to the National Assembly? If the answer is in the negative, why should the President suspend the CJN whose tenure is constitutionally protected without recourse to the NJC and the Senate as prescribed in the Constitution? 16. The CCT Chairman, Danladi Umar, is himself a subject of a pending criminal charge filed by Mr. Festus Keyamo at the Federal High Court on behalf of the EFCC. The CCT Chairman despite the pendency of the criminal charges against him, has not stepped aside and has not been suspended. 17. Okoi Obono-obla, the President’s aide on Public Prosecutions, has not been fired, arrested or prosecuted despite his indictment by the House of Representatives for certificate forgery as attested publicly by the West African Examination Council. Mr. Maina is yet to be prosecuted for allegedly stealing pension funds. There are myriads of odiferous corruption cases against people and officials who are close to this President. Yet, Buhari continues to shield alleged criminals who are his friends and party men. Mr. Buhari is accusing Justice Onnoghen of failure to declare his assets, however, it is on record that Buhari’s own asset declaration is still shrouded in secrecy, and has not been publicly disclosed as he vehemently promised in 2015. What could be more hypocritical than this? 18. One wonders whether a single Justice of the Supreme Court can determine the decision of the court. The Supreme Court sits in a panel of five or seven Justices. If a decision of the Supreme Court is fraudulent procured through bribery, it is only logical to infer that all or majority of the members of the panel were bribed. I am not holding brief for Justice Onnoghen. However, given the delay that greeted the appointment of Justice Onnoghen, one is tempted to ask whether his security clearance was compromised? 19. Itse Sagay has stated that the suspension of Justice Onnoghen is constitutional because the President is empowered to remove the CJN for breach of the Code of Conduct. The learned silk, with respect, is turning the law on its head. That line of argument is inconsistent with the right to presumption of innocence enshrined in Section 36(5) of the Constitution. Justice Onnoghen has not been convicted by any court or tribunal. It is therefore preposterous to say that the President can remove him for violating the Code of Conduct. 20. Let me end by submitting that the atrocious, unconscionable, unconstitutional and duplicitous suspension of the CJN by this vicious and totalitarian regime has eroded our democracy. We all have a duty to oppose and resist it, not for the sake of Justice Onnoghen, but for the sake of posterity and the verdict of history. We should not excuse or defend this crass impunity because of political expediency.